This collection of articles reviews the July 4 weekend race meet at the Indianapolis Motor Speedway in 1910. This was the second race meet of the track's season, the first coming over Memorial Day. 1910 was one of the Speedway's busiest years ever, hosting three major auto race meets, an aviation show and another balloon race. The events of this year even rival the hard work the management team at the Speedway currently performs to pull off their mega-events. This article, published July 10, 1910, reviews the July 1-4 race meet at the Indianapolis Motor Speedway. The upshot is that the event offered a terrific spectacle and fans, drivers and manufacturers found it deeply satisfying. This is a terrific article describing Louis Chevrolet's accident during practice for the Indianapolis Motor Speedway's July 1910 race meet. The car rolled over and Chevrolet escaped serious injury by diving deep into the cockpit. This article reports on early practice for the July 1910 race meet at the Indianapolis Motor Speedway. Warning...this article is of very poor quality. Nevertheless, it's worth your time if you are researching the career of 1908 Vanderbilt Cup winner George Robertson who is the main subject of the information. Also, there is an image of Louis Chevrolet's Buick after it took a tumble during early practice. 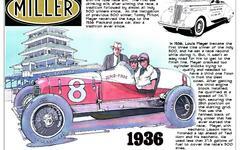 This article was published the morning of the first day of the July 1910 races at the Indianapolis Motor Speedway. This is particularly important to researchers because a good portion of the articles focuses on the ongoing debate over the rules compliance of the Buick 16 racers. Eventually labeled "Marquette-Buicks," the debate raged over whether the cars were truly stock cars or purpose-built racers. After winning several of the races during the meet, the cars were disqualified later in the month. The controversy cast a shadow over the results over the race. This is a great collection of articles on the first day of the July 1910 races at the Indianapolis Motor Speedway. This is a nice collection of advertisements from automobile manufacturers and suppliers that ran the day after the first day of the July 1910 race meet at the Indianapolis Motor Speedway. Not only are they interesting, but they are great quick references for the results of the races. Worth the time. This file was optimized in Adobe Reader 6.0 to achieve file reduction for upload to my site. This is a super package of articles covering the second day of the July 1910 race meet at the Indianapolis Motor Speedway. The main focus is Bob Burman's victory in the Remy Brassard 100 mile contest. Also included are advertisements Buick ran touting their dominance. These ads contributed to their disqualification before the end of the month. The cars were supposed to be Marquette-Buick stock cars, not Buicks. This article appeared in the Indianapolis Star the morning of July 4, 1910. It was also the morning of the Ira Cobe Race. The trophy is in the Indianapolis Motor Speedway Hall of Fame Museum today. This also includes a decent image of Howdy Wilcox' wrecked National from the previous day of the July 1910 race meet at the Indianapolis Motor Speedway. Another super package of articles on the July 1910 auto race meet at the Indianapolis Motor Speedway. This collection covers the last day of the races and features Joe Dawson's brilliant drive in a Marmon to capture the coveted Ira Cobe Trophy.